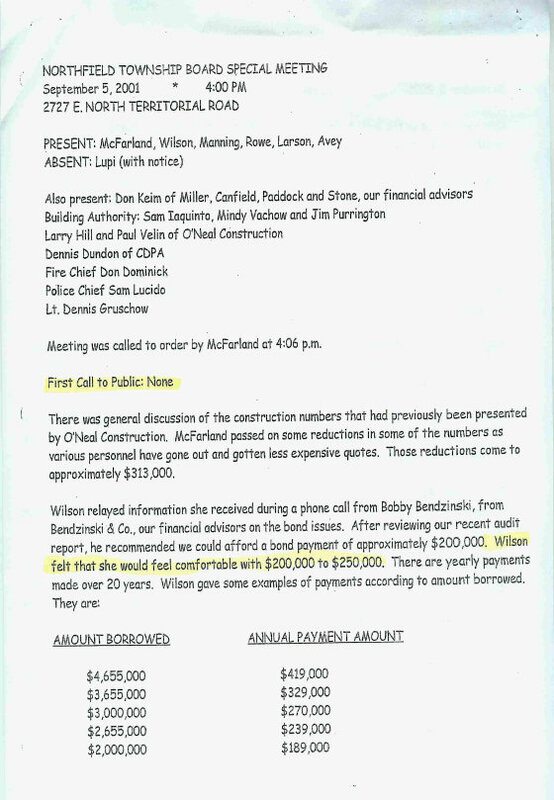 The Public Safety Building debt is the result of a 2001 meeting of the Board of Trustees and the Public Safety Building Authority. At four o'clock on a friday afternoon, they doubled the size and cost of what we now call the Township Hall. Voters had approved a $3,800,000 building and the millage to pay for a $3.8M bond. This wasn't enough for the Township debt addicts. They fired the architect. They threw away $288,881.15 worth of completed plans. They hired a new architect. They staged the secret meeting to borrow $3,000,000 more to pay for the enlarged building. 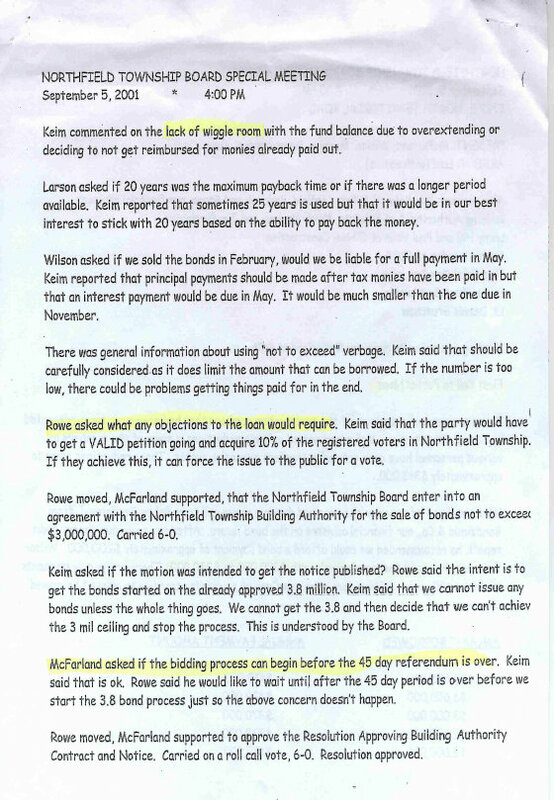 At that meeting, the Board and Building Authority ignored our Bond Counsel's advice regarding the amount of additional debt service we could carry. He said we could afford a payment of $200,000 per year. Instead the Board borrowed $3,000,000. This required $270,000 annual payments out of the General Fund. In 2003-3004, the fiscal chickens came home to roost. The Board was forced to borrow $500,000 to stay afloat. The citizen outrage reached the Ann Arbor News. The final bill? The Board paid a total of $7,678,774.26 for our $6.8M Public Safety Building, double what voters had authorized. That's $878,774.26 in cost overruns. We are still paying off the original $3.8M PSB bond and the $3M board borrow. In 2013, our Township Manager helped replace the PSB bond with a lower interest, $2,415,000 bond. At the same time, we renegotiated the Board's $3M Building Authority bond (2.93M to be precise) into a $2,473,799 bond. 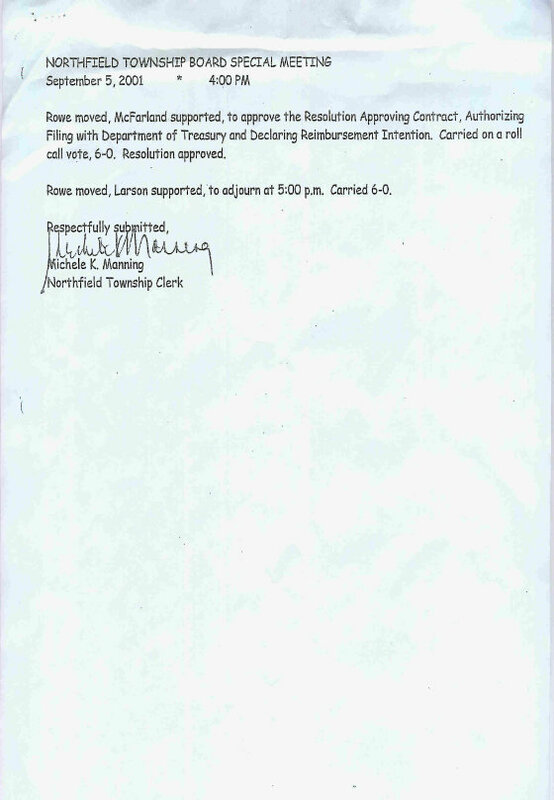 2004's $500,000 emergency borrow appears to have been paid off in 2014. I'll do the addition. Of $6.8 Million borrowed to build our half empty PSB, we still owe $4.9 Million. Some want to dismiss this as old news or water under the bridge, but our Township is still crippled by this unnecessary debt. The history is worth understanding. Why? Because players in this debacle, names you can read on page 2 of the secret meeting agenda, remain vocal in Township Politics today. They deny gambling with tax dollars. They will happily tell you that the consequences of that Board's fiscal recklessness are your Neighbors' fault. If the lack of fiscal conservatism isn't enough to raise your hackles, consider this. Six days after this secret Board decision, 9/11 happened. It never occured to anyone on the Board or Building Authority that the world had just become a more uncertain place. It never occured to any of them to revisit that decision.